This is the second of two articles by biomechanist Craig McDonald describing the kinematics and kinetics of hurdle clearance. The first of the two articles appeared in the previous issue of Track Coach #161, Fall 2002. During the 1988 USA Olympic Trials I filmed 31 of America's best men and women hurdlers, who were competing for positions on the Olympic team. The trials were filmed at 50 frames per second, digitized, and analyzed using three-dimensional analysis. A detailed analysis of the angular momentum of hurdle clearance was then possible. There have been theoretical hypotheses concerning the angular momentum of hurdle clearance, primarily by Geoffrey Dyson, but this is the first hard data to evaluate his theories. During the takeoff, hurdlers produce a relatively small amount of vertical velocity so that they can minimize the loss of forward velocity. Such a takeoff produces a low parabola over the hurdle, and the athletes, especially the men, must make very special motions in the air with their arms, legs, and head-trunk to avoid hitting the hurdle. 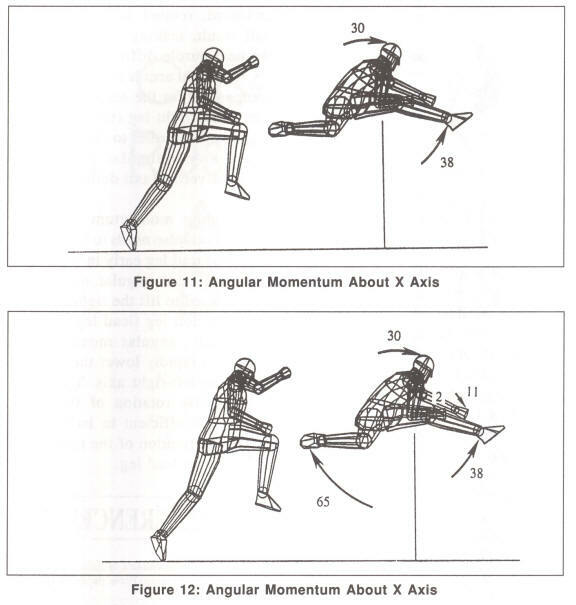 All of these motions related to hurdle clearance require an understanding of the angular momentum (rotation). 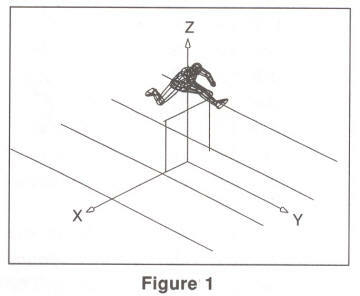 Figure 1 shows a hurdler passing over a hurdle, and the coordinate system used for this analysis. The origin of the coordinate system is on the ground in the middle of the lane; the left-right direction is defined by the X-axis; the forward-backward direction by the Y-axis; the vertical direction by the Z-axis. Rotation can be either clockwise or counterclockwise around any of the three axes. For example, looking along the X-axis toward the origin, clockwise rotation is forward somersaulting rotation, and counterclockwise is backward somersaulting rotation. A force that is not directed through the center of mass (CM) of the hurdler creates angular momentum (rotation). When the hurdler is airborne the angular momentum cannot change, because the only force exerted during that time is the hurdler's weight, which passes through the CM. Therefore, all forces that create angular momentum must be made during the takeoff. The human body is not a rigid object. The athlete's muscle actions in the air decide which parts of the body (arms, legs, head-trunk) take up larger or smaller fractions of the total available angular momentum that was produced during ground support. 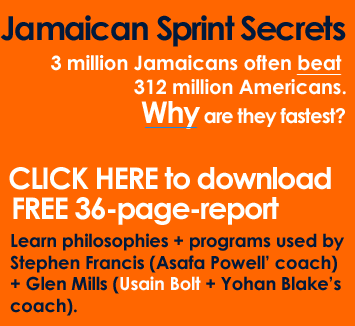 (Previous articles on angular momentum in Track Coach are "Newton and Dyson pumped up on Hill and Cavagna" by the author in No. 149, "The Rotation Over the Bar in The Fosbury-Flop High Jump" by Jesus Dapena, No. 132, and "New Insights on Discus Throwing" by Dapena in No. 125). The overhead view in Figure 2, in which the line across the lane represents the hurdle position, shows that after taking off from the ground the trail leg is abducted, or moved outward, away from the midline of the body. Then the trail leg is brought forward around the right side of the body. This motion allows the trail leg to clear the hurdle. If the hurdler had no angular momentum about the vertical axis, then the forward rotation of the trail leg would make the rest of the body rotate, by reaction, in the opposite direction. In other words, the forward motion of the trail leg would make the rest of the body rotate clockwise toward the trail leg. This rotation would produce an awkward landing position with the head-trunk turned toward the right. Geoffrey Dyson, a pioneer in explaining hurdle clearance, observed that the right arm was thrust forward during the initial part of hurdle clearance, and during the later part of hurdle clearance swung outward and backward. (See Figure 2.) He hypothesized that the clockwise angular momentum (rotation) of the right arm compensated for (or offset) the counterclockwise angular momentum (rotation) of the trail leg. He believed that the whole body had zero angular momentum about the vertical axis at takeoff, and that the clockwise motion of the right arm kept the rest of the body facing forward as the trail leg was brought forward. 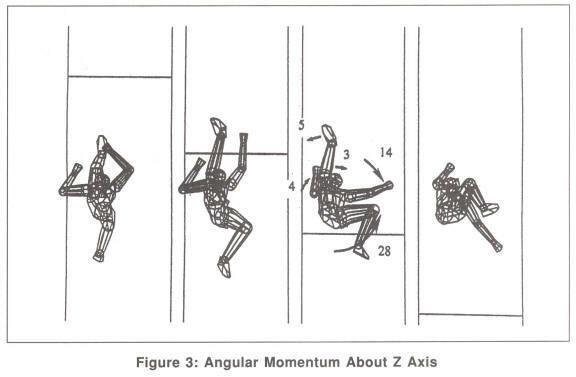 Figure 3 shows the observed average angular momentum values about the vertical axis produced by a male hurdler during hurdle clearance. Most values are as expected. The left arm and left leg, which rotate very little about the vertical axis, had very small amounts of angular momentum. Also the forward motion of the right leg (the trail leg) requires counterclockwise angular momentum. The outward and backward motion of the right arm requires clockwise angular momentum, as predicted by Dyson. However, the clockwise angular momentum of the right arm is only half as large as the counterclockwise angular momentum of the right leg (14 versus 28). Therefore Dyson's hypotheses of a balance between the right arm and right leg is only half-correct. If the total angular momentum of the whole body were in fact zero, then the remainder of the body would have to compensate for the other half of the counterclockwise angular momentum of the trail leg. As noted earlier, this clockwise rotation of the remainder of the body would produce a poor landing position. In order to avoid a poor landing position rotated to the right, the hurdler must acquire a net counterclockwise angular momentum about the vertical axis from the ground during the takeoff. During the brief early time that the center of mass was behind the foot, the hurdlers push on the ground to the right. And then during the middle and late ground support, after the center of mass is ahead of the foot, the hurdlers push on the ground to the left. 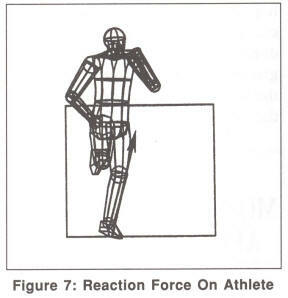 Figure 4 shows the direction of the reaction forces exerted by the ground on the athletes. These reaction forces created the counterclockwise angular momentum. Figure 5 shows that the hurdlers did not have a net zero angular momentum about the vertical axis during hurdle clearance. They acquired counterclockwise angular momentum during the ground support. This angular momentum allowed the right leg to be brought forward without rotating the remainder of the body to the right. So Dyson was partially correct. The outward and backward motion of the right arm partially compensates for the forward motion of the right leg (trail leg). However, the right arm is not enough on its own to equal the angular momentum of the trail leg. The hurdler must also acquire counterclockwise angular momentum during the takeoff by pushing on the ground, first to the right and then to the left. This produces rotation about the vertical axis. The Y-axis points in the direction of the hurdle race. In the rear view in Figure 6 (looking in the direction of the race) the hurdler, as seen before, abducts the trail leg (moves it away from the midline of the body) to allow hurdle clearance. Dyson again assumed that the body had a net angular momentum of zero about the Y-axis. As a result, he concluded, as shown in Figure 6, that the abduction of the trail leg forced the head-trunk to tilt to the right, through a rotational action and reaction mechanism. Figure 6 clearly shows the abduction of the trail leg. However, contrary to Dyson's theory, the hurdler shows no rotation (tilt) of the head-trunk toward the right. Such a rotation would be very difficult to produce physically, because it would require an incredible amount of flexibility in the right hip joint. The fact that the head-trunk does not tilt clockwise to balance the counterclockwise rotation of the trail leg implies that the angular momentum of the whole body about the Y-axis must not be zero. The body must have a net counterclockwise angular momentum around the Y-axis produced during the ground support prior to takeoff. Recall that during most of the ground support prior to hurdle clearance the athlete pushed downward and toward the left on the ground. The reaction force shown in Figure 7 acting on the hurdler would be directed upward and toward the right. This force, which passes to the right of the center of mass, produced the counterclockwise angular momentum needed for the trail leg to be raised as shown previously in Figure 6. This angular momentum made it possible to lift the trail leg, and did not require the head-trunk to tilt to the right as compensation. But when the trail leg has completed its abduction, the angular momentum that rotated the trail leg upward and away from the body must now be used by another limb, because the total angular momentum cannot change in the air. If another limb did not use the counterclockwise angular momentum "freed up" from the trail leg, the head-trunk would start to rotate in a counterclockwise direction in the second half of the hurdle clearance, causing a poor landing position. In the second half of the hurdle clearance, the counterclockwise angular momentum no longer used by the right (trail) leg, as it slows down and completes its abduction, is used by the right arm and the left leg as shown in Figure 8. These actions of the right arm and of the left leg prevent the counter-clockwise rotation of the trunk, and thus permit a good landing position. The X-axis is at a 90-degree angle (perpendicular) to the direction of the race, pointing toward the reader in Figure 9. Dyson and Bernard Hopper (5) theoretically deduced that the hurdler needs clockwise angu1ar momentum around the X-axis for hurdle clearance. 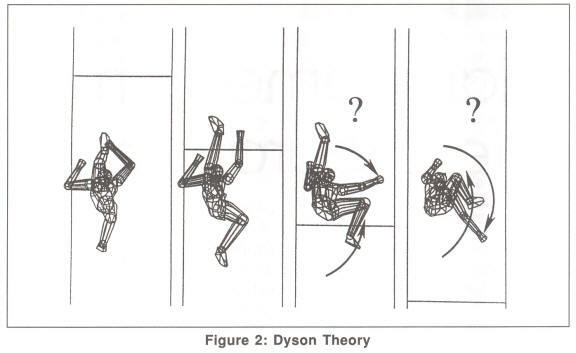 In addition, Dyson theorized that during the later part of the hurdle clearance, the lifting of the head-trunk, a counterclockwise rotation, helped to lower the lead leg, a clockwise rotation, through a rotational action and reaction mechanism. The values in Figure 10, which show the measured angular momentum values, confirm the first theory, but only partly confirm the second. The figure shows the angular momentum about the X-axis computed for the arms, legs and head-trunk during the later part of the hurdle clearance. The values show that the raising of the head-trunk (11 units) does help to lower the lead leg (66 units) through a rotational action and reaction, although very weakly. The head-trunk contains only 11 units of counter-clockwise angular momentum, while in contrast the lead leg requires 66 units of clockwise angular momentum. These values show that the lead leg was not lowered mainly by the raising of the trunk; it was lowered because the body as a whole had a large amount of clockwise angular momentum. This angular momentum had to be acquired during the ground support prior to hurdle clearance. 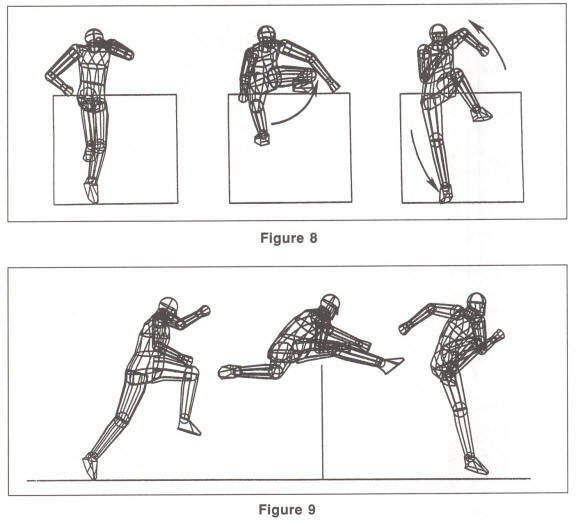 For the early part of the hurdle clearance, shown in Figure 11, Tom Ecker proposed that the simultaneous raising of the lead leg and lowering of the head-trunk occurred through a rotational action and reaction mechanism. The numbers that we found confirm Ecker's theory for the most part. The 30 units of clockwise angular momentum of the head-trunk are nearly equal to the 38 units of counterclockwise angular momentum of the lead leg. However, the values were 66 units clockwise and 11 units counterclockwise during the later part of the hurdle clearance. So, during the early part of hurdle clearance, where were the additional units of clockwise angular momentum needed later for the lead leg to be brought down quickly? According to previous theories and to the numbers found, there is clockwise angular momentum about the X-axis in the later part of the hurdle clearance, necessary for the lowering of the lead leg. But then there must be clockwise angular momentum hiding somewhere in the first part of the hurdle clearance, while the lead leg is being raised. Recall that angular momentum cannot be altered while airborne. Since the lead leg and the head-trunk during the early part of hurdle clearance essentially cancel each other, where was the additional clockwise angular momentum of the body in the early part of the hurdle clearance? No theories had been suggested concerning this question until the current project. 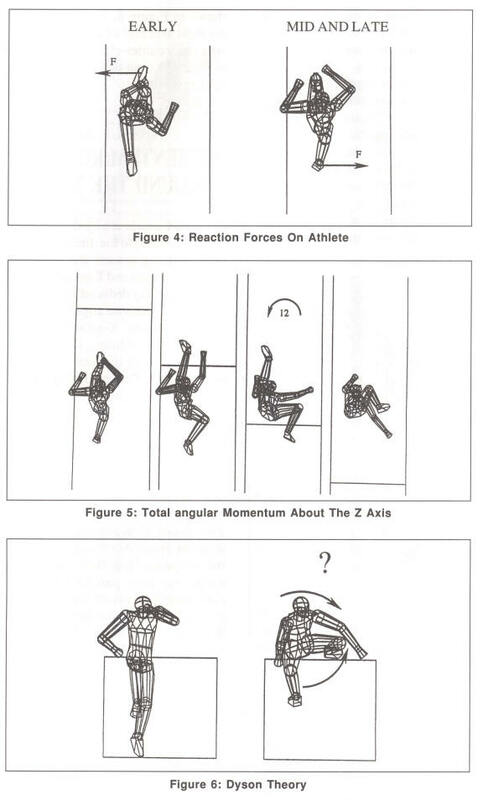 Figure 12 shows that in the early part of the hurdle clearance, while the lead leg was raised and the trunk leaned forward, essentially canceling out each other's angular momentum, the trail leg accounted for the net clockwise angular momentum of the whole body. So the hurdler obtains clockwise angular momentum during ground support. During the early part of the hurdle clearance, the trail leg takes up essentially all of this clockwise angular momentum as it is lifted behind the body. After the hurdler completes the "splits" position over the hurdle, the clockwise angular momentum is transferred from the trail leg to the lead leg, so that the lead leg can be brought rapidly down and backward. Figure 13 shows a sequence of a hurdler in which the trail leg uses a large amount of clockwise angular momentum during the early part of the hurdle clearance. The nearly straightened trail leg continues to come up behind the rest of the body before it starts abduction at the hip and flexion at the knee as shown in the second image of the sequence. Coaches have advocated this technique for many years, preaching against the "premature trail leg." The advantage of splitting the legs far apart in the early hurdle clearance is that it allows the trail leg to have more angular momentum available for transmission later on to the lead leg. In the third and fourth images of the sequence the trail leg has moved into the position necessary for hurdle clearance, and no longer uses the clockwise angular momentum, which is now available for the rapid lowering of the lead leg. If the clockwise angular momentum was acquired during ground support, but was not used by the splits-like trail leg technique, the whole body will rotate clockwise more during the first half of the hurdle clearance, which will make it more difficult to lift the lead leg over the hurdle. If the clockwise angular momentum is not present, it may not be possible to bring the lead leg downward fast enough after the hurdle clearance. A slower pull-down motion of the lead leg will solve the angular momentum problem, but the hurdler will most likely land with the foot well ahead of the center of mass, and is thus likely to receive a large horizontal braking force from the ground. 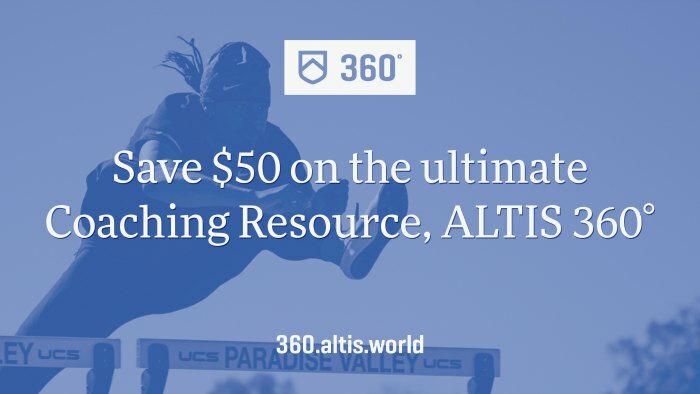 If the hurdler insists upon lowering the lead leg rapidly, the hurdler will land in a position with the head-trunk rotated counterclockwise, resulting in a backward lean. This landing position will make it more difficult to break the fall of the center of mass, there will be additional loss of forward velocity, and a smooth continuation into the next step will be very difficult. In order to pass over a hurdle with minimal loss of forward velocity, the center of mass must pass over the hurdle as low as possible. To accomplish this task, a hurdler must move the arms and legs in specialized motions that require angular momentum. The needed angular momentum must be acquired through pushes made on the ground during the takeoff. Without the appropriate angular momentum after takeoff, an awkward, rotated landing position will result, making continuation to the next hurdle difficult. The right arm is not sufficient to compensate for the angular momentum of the right leg (trail leg). This requires the hurdler to acquire counter-clockwise angular momentum about the vertical axis during the takeoff. 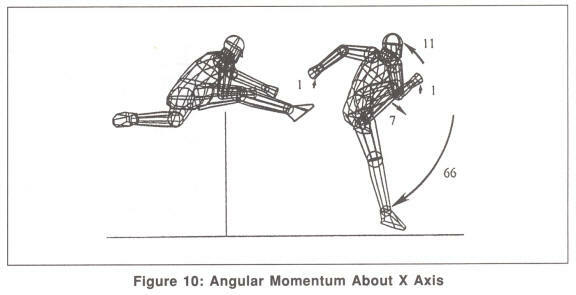 Angular momentum about the forward axis also needs to be acquired to lift the trail leg early in the hurdle clearance. This angular momentum is later used to lift the right arm and lower the left leg (lead leg). Finally, angular momentum is needed to rapidly lower the trail leg about the left-right axis. The counter-clockwise rotation of the head-trunk is insufficient to balance the clockwise rotation of the rapid pull-down of the lead leg.